In Alexandria, the Villa Aghion by the Perret brothers gutted ! 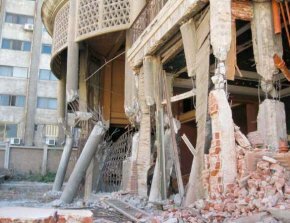 During the night of 28 August 2009, after several years of quiet fighting, fate finally struck and the Villa Aghion built by the Perret brothers in Alexandria in 1926-1927 was gutted by bulldozers, in total disregard of Egyptian law (ill. 1). The Perret brothers received the commission for this private residence from Gustave Aghion, an architect in the cosmopolitan and French-speaking high society circles of Alexandria. 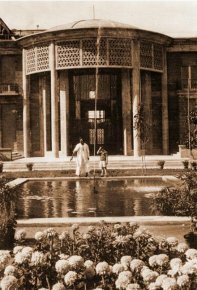 The surveys directed by Auguste Perret started in 1926 and the summer of 1927 brought about the completion of this villa with upper floors and a garden in back, located in one of the wealthiest neighborhoods of 19th century Alexandria, Wabour El-Maya. 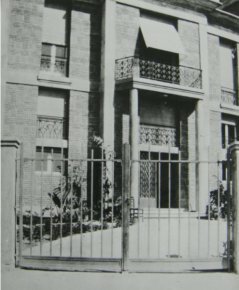 This building thus corresponds to the beginning of the Perret brothers’ presence in Egypt, with in 1927 a project for a Dominican Convent in Cairo, between 1933 and 1934 the Edouard Aghion building in Alexandria, between 1935 and 1938 the villa of Elias Awad Bey in Cairo on the edge of the Nile, then in early 1938, the start of a building for Ali Yehia Bey in Alexandria. The Aghion private residence, was therefore the first of a series of three buildings in Alexandria. Gustave Aghion provided them with numerous commissions through his circles as Edouard was his brother and Ali Yehia Bey, a cotton trader whose business manager was a close friend. Although all architecture historians are familiar with these buildings, the problem in analyzing the Egyptian projects of the Perret brothers, and especially the Villa Aghion, comes from the fact that there is very little documentation on them and that sources often contradict each other. Until recently, there was even a debate as to whether the buildings were really by them. While some of the texts describing them may seem overstated, they leave no doubt as to their admiration : “It is in the Aghion residence (…) that the Perret brothers’ creative spirit found free rein. They had enough space at their disposal to surround the residence with gardens made up of lawns, pavements, water mirrors ; they could afford the luxury of a mosque cupola, crowning at over eleven metres high the hallway between the main salon and the dining room, and their facade is a pleasant inspiration halfway between Oriental and Western”, writes the critic Gaston Varenne in 1927 . Built between 1926 and 1927 in the Palladian style (ill. 2 and 3), relatively different from the Perrets’ French buildings, the house was constructed on a square lot with the Perret brothers producing the bulding, the garden and the furniture in the dining room. Whereas the reference to Palladio is obvious given the central layout with three bays and the main hall open on both levels, the ironwork with lotus motifs can be seen as an allusion to a recurrent Egyptian architectural theme. The palm leaves lter reappeared in the 1930’s, thus revealing here a precedent. Fillings are provided by reinforced concrete without plaster and Egyptian bricks layed out differently depending on the façades. The play of two colours and the relief create effects between the smooth and the salient strips on the building. As concerns the layout of the building, its relative lack of symmetry continues to intrigue. The main rooms are symmetrical and lined up but the service quarters present vertical links determined by functional measurements and forms. Two staircases lead from the garden to a semi-circular hallway with a semi-circular ceiling in the form of half a concrete rotunda, jutting out over the garden and covered with five triangular claustra panels of reinforced cement. The triangular claustras were supposed to filter the sunlight and were often used later in Perret projects, but this is their first instance. The rotunda with colonnade which architects would use twenty years later at the Musée des Travaux Publics is one of the first examples here ; the lines of the cupola are underscored by the very slim forms of the columns without capitals. On the back sides, there is a play of bays which the architects used to reduce the lack of symmetry arising from the difference in the number of openings. The hall with its cupola reveals the brothers’ interest in this form transforming it into a modern architectural motif no longer reserved for religious use. The rooms on the ground floor fan out from the hall which is the main element of the house connecting its two wings and also leading to the first floor. On one side there are two salons, on the other a dining room, kitchen and pantry, all round the central space. The kitchen is the principal asymmetric element. A mezzanine includes, besides the service quarters, a small dining room ; the first floor holds the apartments, and the second includes a laundry room and one bedroom. Commissioned by a wealthy Jewish family in Alexandria, the house was apparently sold after the Nasser revolution and the departure of the owners. The spectacular rise in the population of Alexandria these last thirty years has overrun the city, which counted only 232,000 inhabitants in the early 20th century but today represents almost 5 million . As concerns the Aghion residence, its conservation is endangered because of this fact. The lack of housing is such that the land now is worth millions. Both the owners and real estate developers want to see it destroyed so as to erect four buildings on the property. This also explains why another building already abutted the villa on the west. The slow process of deterioration chosen by the owner will probably allow the building, after the fateful gutting, to be declared a future, perhaps immediate, safety hazard and require its destruction. This type of action is in fact frequently practiced so that a developer can obtain the demolition of a property which is supposed to “be protected”. The house with its closed shutters and deteriorated aspect has not revealed any of its secrets for many years now. One can barely glance at the façade from the street before the police agent from the intelligence services department next door asks passersby to move on. Rumor has it that the intelligence services are interested in acquiring the land which is directly adjacent to their headquarters here in Alexandria. The villa with its scraggy exterior had long since lost its splendor and awaited its fate patiently, seeing it arrive finally last 28 August. A bulldozer arrived at dawn to gut its façade on the garden side, with the cupola still standing only by divine intervention it seems. Although the everyday worries of the population and the immediate needs of families in the city are in no way negligible, how is it possible to allow such destruction and progressive denial of national heritage without any reaction ? The study of this villa is not enough to ensure its existence but the awareness of its importance to heritage, especially by Egyptian authorities, should have established the right to bequeath it to future generations. Although the villa appears in the list of protected monuments recently issued by Egyptian authorities under law 144, nothing has been done however and no surveys have been possible. While the aura of the Perret brothers’ architecture has now become international, it is our duty to recall that their other work was also, including abroad. French heritage alone does not account for the extent of their architectural production. The Aghion villa is thus a perfect example of Perret architecture applied to a private commission. “Without renouncing their fundamental principles, the Perret brothers, it seems, never came closer to the “1925” style than here at the Hôtel Aghion. The Palladian plan, the super-structuring of the volumes, the façade with semi-rotunda on the garden (…) all of these elements together do in fact inscribe it within Art-déco architecture (…). Despite its Art Déco aspects and some borrowing from local styles, the hôtel Aghion will be perceived as one of the best instances of Perret classicism” . Given that Alexandria played an important role in welcoming architectural experimentations in the first half of the 20th century, this heritage should be recognized as an essential part of the city’s structural patrimony, despite the problems linked to accepting a painful historical past. The mere fact that this private residence was the first of two other architectural projects carried out in Alexandria should be enough to understand the importance of the traces left by Auguste and Gustave Perret on the architectural and patrimonial history of a city in danger of losing its identity. In concluding, is it possible for a country with such a rich heritage and which has engendered so many vocations among artists, architects and art historians to massacre it in silence ? Is the lure of tourist revenues no longer enough ? We shouldn’t forget that the Egyptian Minister of Culture recently ran for the post of Secretary General at Unesco ! Gaston Varenne, “Le classicisme des frères Perret appliqué aux problèmes de l’architecture moderne », La Demeure française, n°3, autumn 1927, p. 35. Robert Ilbert, Alexandrie 1830-1930, histoire d’une communauté citadine, Le Caire, IFAO, 1996, v. 1, p. 158. 3. Maurice Culot, David Peycere, Gilles Ragot, Les frères Perret : l’oeuvre complète, Paris, IFA, Norma, 2000, p. 159. Next article in Heritage : Concrete question : how to mortgage the Hôtel de la Marine ?